Once the Roman Empire is under your command, don't lay down your sword just yet - the Barbarians are coming. With two award-winning titles from the esteemed Total War series, you'll have twice as many obstacles and opportunities to control and conquer the greatest empire ever known to man. Rome: Total War Guide one of three noble Roman families on a century spanning quest to seize control of the Roman Empire. (official expansion pack to Rome: Total War) Witness the decline of Rome as Barbarian hordes attack, forcing a bitter internal struggle between rival factions. Once the Roman Empire is under your command, don't lay down your sword just yet - the Barbarians are coming. With two award-winning titles from the esteemed Total War series, you'll have twice as many obstacles and opportunities to control and conquer the greatest empire ever known to man. 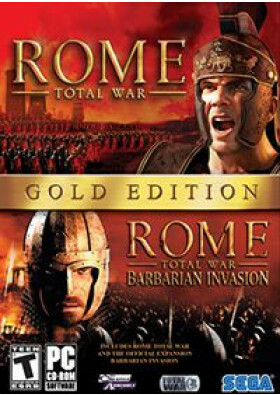 The Collection Edition includes: Rome: Total War Guide one of three noble Roman families on a century spanning quest to seize control of the Roman Empire. Rome: Total War - Barbarian Invasion (official expansion pack to Rome: Total War) Witness the decline of Rome as Barbarian hordes attack, forcing a bitter internal struggle between rival factions.